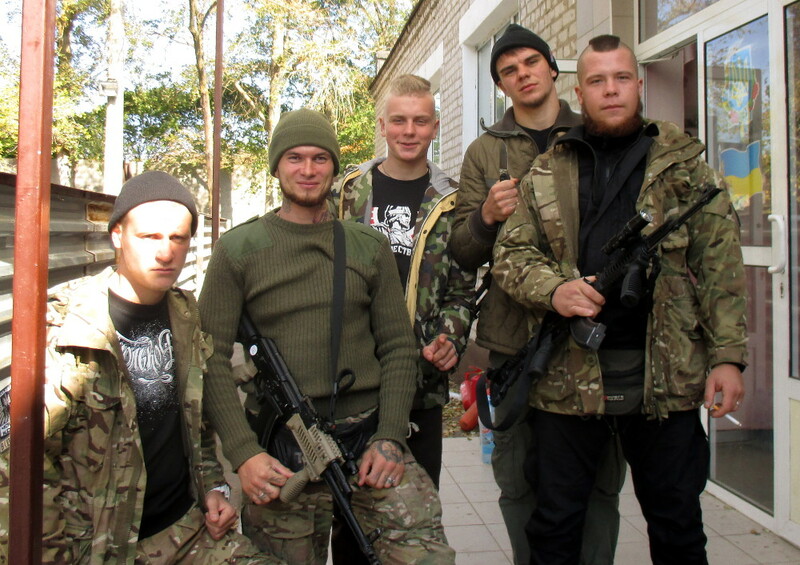 You are here: Home › Analysis › Right-wing extremism › A new (order) Ukraine? ANALYSIS: Now that the EU is set to embrace the new Ukrainian government and invest at least 1 billion euros in the “revolutionized” country, it is time to reinvestigate the question of far-right influence in Ukraine. 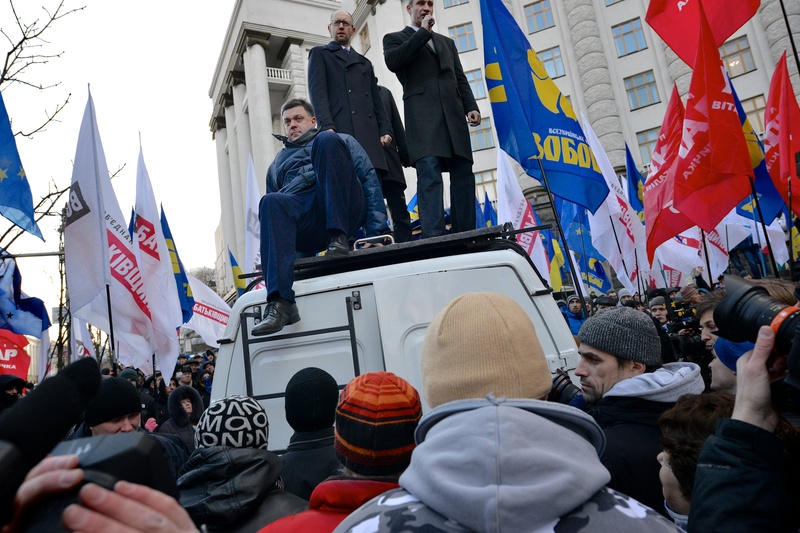 Opposition leaders Oleh Tyahnybok, Vitali Klitschko and Arseniy Yatsenyuk, addressing demonstrators, November 2013. Tyahnybok is the leader of the far-right Svoboda party. (Photo: Ivan Bandura, under Creative Commons license, BY-ATT 2.0). 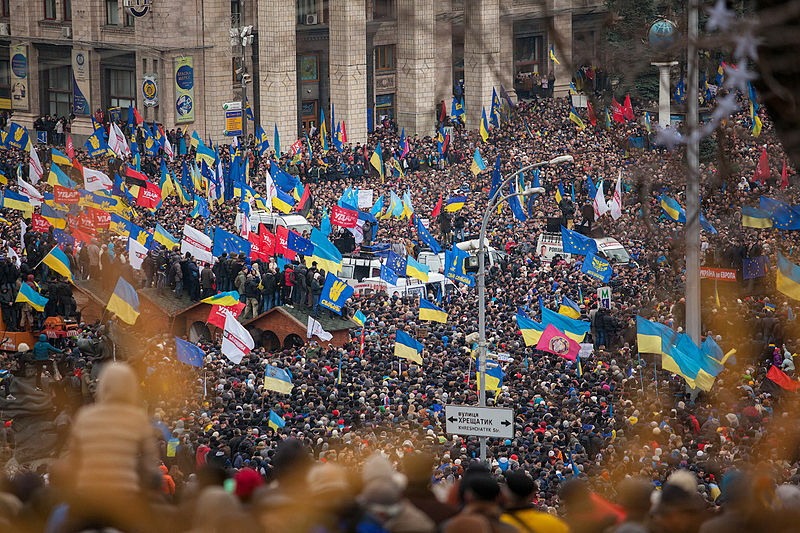 The Euromaidan “revolution” will undoubtedly remain one of the key political events of 2014. Most domestic and foreign observers were completely taken by surprise by the events that followed President Viktor Yanukovych’s decision not to sign an integration treaty with the European Union (EU) in November 2013. While the initial demonstrations in downtown Kiev were somewhat expected, few had ever thought that they could spiral so out of control that, just three months later, a democratically elected government with one of the most popular politicians in the country was forced out of power. Euromaidan has also been interesting in terms of the propaganda battle that has been fought in the traditional and social media. As is now standard for “revolutions” in the 21st Century, activists were quick to set up several Facebook pages, Twitter accounts, and other websites to provide their own positive view of the “revolution”, countering the negative reports from the official Ukrainian media and, particularly, the largely Kremlin-controlled Russian media. They were very successful in disseminating their message, in part through networks of sympathizers in the West (including Ukrainian émigré communities in North America and post-Soviet scholars across the globe). One of the main struggles has been over the importance of “fascists” in the Euromaidan. Almost from the beginning the pro-Kremlin media emphasized the importance of “Ukrainian fascists” among the anti-government demonstrators, and within days the whole uprising was to be portrayed as “fascist”. This was to be expected, as both Soviet and post-Soviet Russian elites have tended to equate Ukrainian nationalism with fascism, linking any and every anti-Soviet or anti-Russian movement to the infamous Organization of Ukrainian Nationalists (OUN) of Stepan Bandera, which (temporarily) collaborated with Nazi Germany in a misguided attempt to gain Ukrainian independence from Stalin’s brutal Soviet regime. At the same time, most domestic and foreign sympathizers of Euromaidan have minimized the importance of the far right, arguing that Euromaidan was a genuine democratic and pro-European uprising in which far-right elements were insignificant. Euromaidan became the latest cause of Western celebrities, from Archbishop of New York Cardinal Dolan to actor George Clooney, and academics, from Andrew Arato to the inevitable Slavoj Žižek. Much more surprising, however, was that some of the same scholars who had been warning us against the rise of the far right in pre-Euromaidan Ukraine were now scolding us for exaggerating the importance of the far right in Euromaidan. Even worse, any specific emphasis on far right elements within Euromaidan would lead to “Russian imperialism-serving effects”. Arguing by and large that they should be the only ones to judge the situation in Ukraine, given that they were the (only) “experts on Ukrainian nationalism”, these scholars declared Euromaidan “a liberationist and not extremist mass action of civil disobedience”. Now that the “revolution” is supposedly won, and the EU is ready to embrace the new Ukrainian government and invest at least 1 billion euros in the “revolutionized” country, it is time to reinvestigate the question of far-right influence in Ukraine. After all, the EU has always been an outspoken critic of far-right parties and politicians. In fact, only last month EU Commissioner Cecilia Malmström declared publicly: “The biggest threat [for the EU] right now comes from violent right-wing extremism”. While not a scholar of Ukrainian nationalism, I have heeded the true experts’ call to “do some serious reading on the issues” before writing this article. What follows is a short analysis of the electoral and political relevance of the far right in contemporary Ukraine, based in part on the works of many of these experts. Moreover, I put the Ukrainian far right in a comparative European perspective, both in terms of ideology and relevance, as this is the political context that both the new Ukrainian government and the EU elite (or EUlite) deem most appropriate. Let us start with assessing the electoral strength of far-right political parties in Ukraine. Several far-right parties contested the last parliamentary elections in October 2012, but only one was really important: the All-Ukrainian Union “Svoboda” (Freedom). The party was officially founded as the Social-National Party of Ukraine (SNPU), in an ominous reference to Adolf Hitler’s National Socialism Workers’ Party of Germany (NSDAP), in 1995. The SNPU restricted membership to “ethnic Ukrainians” and sported the Wolfsangel (Wolf-hook) as the party symbol, an ancient runic symbol that was adopted by several Waffen SS divisions during the Second World War and that remains popular among neo-fascist groups around the world. Despite the overt neo-fascist references, co-founder Oleh Tyahnybok was elected to the Verkhovna Rada (Ukrainian parliament) in 1998. Four years later he was re-elected as part of the democratic Our Ukraine Bloc of Viktor Yushchenko. In 2004 Tyahnybok became the party leader of the SNPU and started a campaign of “moderation” and “mainstreaming”. He changed the name to Svoboda, minimized the use of the Wolf’-hook and started to expel some of the neo-Nazi members. At the same time, he was thrown out of the Our Ukraine Bloc in July 2004, after making anti-Semitic (“Muscovite-Jewish mafia”) and revisionist statements. This notwithstanding, Tyahnybok and Svoboda supported the Orange Revolution later that year and were temporarily welcomed back into the All Ukraine Bloc camp. After the Orange Revolution, Svoboda was able to gain support on the basis of its radical opposition to the Yushchenko government, which became increasingly unpopular in the “ethnically Ukrainian” western part of the country. In the 2010 local election Svoboda gained between 20 per cent and 30 per cent in Eastern Galicia, entering many local and regional parliaments as well as some local governments. In the 2012 parliamentary elections it won 10 per cent of the national vote, bringing 37 deputies in the Verkhovna Rada. While the party gained a mere one per cent in the three eastern regions of the country, support was between 30 per cent and 40 per cent in the three western regions. In the biggest western city, Lviv, the symbol of pro-western and pro-EU Ukraine, Svoboda constitutes the largest faction in the local council. In ideological terms Svoboda is quite similar to the other parties that it collaborates with in the Alliance of European National Movements (AENM). Most of these parties are openly anti-Semitic and racist, while their support for democracy is nominal and mostly professed strategically and temporarily. These mostly marginal parties are excluded from the new Alliance for European Freedom (AEF), the new European collaborative project of more “moderate” and relevant radical-right parties like the Austrian Freedom Party (FPÖ), the Dutch Party for Freedom (PVV) and the French National Front (FN). The only other electorally relevant AENM member party is the Movement for a Better Hungary, Jobbik, which gained almost 17 per cent of the vote in the 2010 Hungarian parliamentary election. Despite its electoral relevance – it is one of the most popular far-right parties in Europe – Jobbik is shunned by the EAF parties for its anti-Semitism and extremism (in part through its now-banned paramilitary Hungarian Guard). But while gaining more votes than Svoboda, Jobbik is politically marginalized by the national conservative Fidesz party of Prime Minister Viktor Orbán, which holds a constitutional majority in the Hungarian parliament. In sharp contrast, Svoboda has several ministers in the new Ukrainian government, including a deputy prime minister, and one of its members, Oleh Makhnitsky, was appointed the country’s prosecutor general. 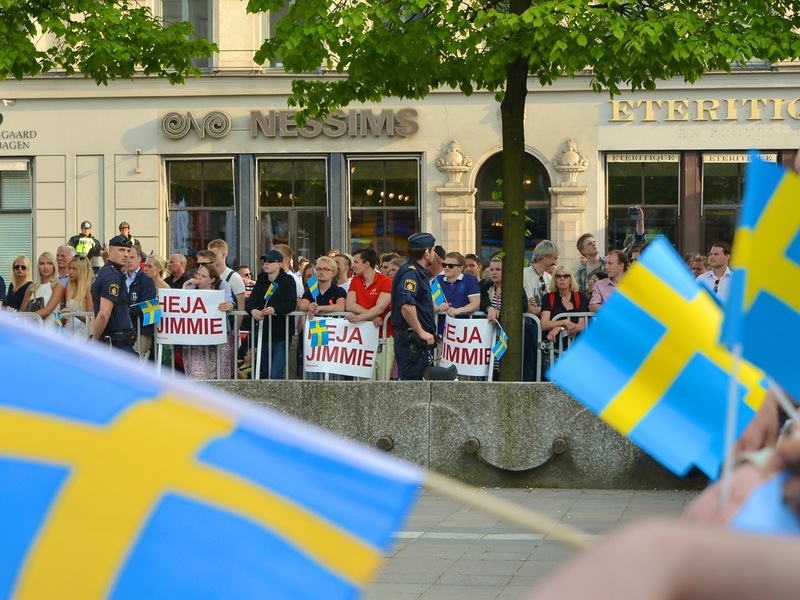 This is a stronger governmental presence than Latvia’s National Alliance (NA), currently the only far right party that is part of a national government in an EU member state. Moreover, NA is considerately more moderate than Svoboda, as it is an alliance of the far right All For Latvia! and the national conservative For Fatherland and Freedom/LNNK. But Svoboda is not even the most extreme far-right group represented in the new Ukrainian government. Pravyi Sektor (Right Sector) is a coalition of mostly smaller far-right groups, including various neo-fascists and neo-Nazis, which came together during the protests. It has presented itself as the defender of Euromaidan, but has also been linked to much of its most violent actions, including against other (radical-left) demonstrators. According to Emmanuel Dreyfus, in an insightful and largely sympathetic account of the new Ukrainian situation, “Pravy Sektor defines itself as ‘neither xenophobic nor anti-Semitic, as Kremlin propaganda claims’ and above all as ‘nationalist, defending the values of white, Christian Europe against the loss of the nation and deregionalization’.” Recent incidents showed that leading members of the group are willing to use violence and weapons to defend these values. The leader of Pravyi Sektor, Dmytro Yarosh, a 25-year veteran of Ukrainian far-right politics, was appointed Deputy Secretary of the National Security and Defence Council, which advises the president on the national security strategy of Ukraine. Yarosh serves under the new Secretary, Andriy Parubiy, who formed and led Euromaidan’s Self-Defence (Samoobrona) units during the protests. While Parubiy was most recently a member of Yulia Tymoshenko’s Batkivshchyna or the All-Ukrainian Union “Fatherland”, he has a long history in Ukrainian far-right politics. Most notably, he is the co-founder of the SNPU (with Oleh Tyahnybok). Parubiy does not seem to have changed his ideas fundamentally. In 2010 he wrote a letter to the European Parliament, protesting its resolution that “deeply deplores the decision by the outgoing President of Ukraine, Viktor Yuschenko, to posthumously award Stepan Bandera, a leader of the Organization of Ukrainian Nationalists (OUN), which collaborated with Nazi Germany, the title of ‘National Hero of Ukraine'”. So where does that leave us with regard to the role of the far right in the “new” Ukraine? Clearly Russian media and politicians exaggerate the importance of the far right in Ukraine. Euromaidan was not a “fascist coup” by “Banderovtsi”. If that were truly the case, “democratic Ukraine” is fighting an increasingly powerful enemy and it is doing this with only part of its leadership. Not only do far-right parties in Ukraine have a popular support that is well above the EU average, although only half of that in some west European countries (like Austria and France), the main far-right party is more extreme than most of its “brethren” within the EU, and occupies significant positions of power within the new Ukrainian government and state. On top of that, whereas EU countries actively persecute violent and anti-democratic neo-fascists, like Golden Dawn in Greece, they have entered key positions within the Ukrainian state bureaucracy. This should be a cause of considerable concern for EU politicians and scholars of Ukrainian nationalism alike. This article was originally published on OpenDemocracy on 28 February 2014. It is republished here with the kind permission of Cas Mudde. Anton Shektovtsov published a reply on his own blog. Cas Mudde is a Dutch political scientist who focuses his studies on political extremism and populism in Europe. He has published a number of books, including Populist radical right parties in Europe.